PlayStation is moving to be a lot more like Nintendo and Xbox as they offer direct broadcasts announcing new games, content, and release dates. You can watch PlayStation State of Play broadcast right here. 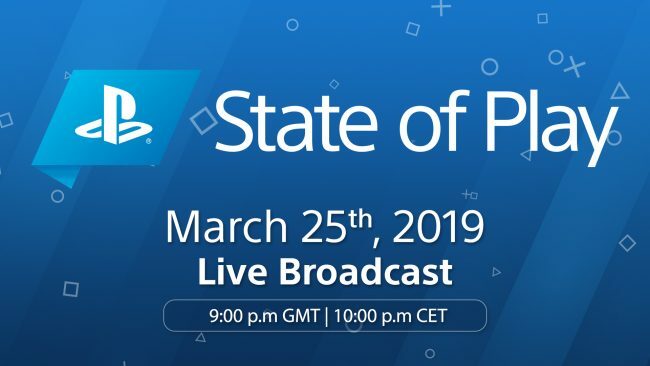 “A new live show from PlayStation, dubbed State of Play, will launch on March 25th at 2:00 pm PT/5 pm ET. The idea is to offer fans a convenient place with which to garner information about software updates, game announcements, and more. State of Play’s inaugural episode is set to show off new trailers and gameplay footage from upcoming PlayStation 4 and PlayStation VR titles. In addition, as teased by the PlayStation Blog, “new game announcements” are also on the cards. What are you hoping gets announced? We did a lot of speculating and hoping for different things, including games and other hardware announcements. We also mused on State of Play as the future of how gaming companies will do broadcasts and announcements, as Sony is the latest to follow in a trend that Nintendo and Microsoft had both adopted before it. Today’s broadcast marks the first of many and should set a new trend for PlayStation announcements that we’ll see throughout the year. It will be interesting to see if this is the same format that Sony holds to beyond the release of next-generation platforms. We could very well be seeing Sony gearing up for how they plan to present new games announcements in the future. Nintendo Directs have been very successful for Nintendo and generating buzz around their announcements, so we’ll see how Sony’s stack up.